Are you a builder looking for stunning replacement sash windows, timber windows or casement windows in Motspur Park or Norbiton? 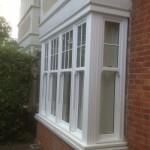 Perhaps you are a homeowner looking for a windows company to supply and fit sash windows? Or maybe you live under a flight path and are considering replacement triple-glazed sash windows for your period home? Here at Merton Windows and Doors, we are a FENSA-registered, reliable and friendly glazing company supplying range of products to homes and businesses in the area. We pride ourselves on our reputation for our honest approach, expert products and outstanding workmanship, where no job is too big or small for our team, from single window replacements, through to huge new build and commercial projects; we are the team for you. Our tried-and-tested products are all sourced from award-wining manufacturers and come with excellent energy efficiency, security and low maintenance properties and are also guaranteed for at least 10 years for your peace of mind. To find out more, please call us on please call 0208 542 2233. 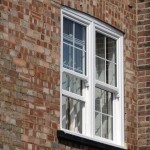 Sash windows have always been a popular choice because of their elegant and chic aesthetic. 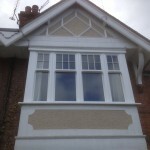 These windows are ideal for period Victorian, Edwardian and Georgian homes but can also enhance the looks of contemporary and commercial properties. 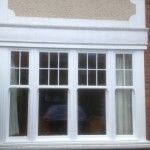 We can supply and fit timber sash windows but also offer sash windows, manufactured in more modern uPVC and aluminium. 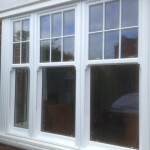 uPVC sash windows mimic the appearance of timber but boast the properties of more technologically-advanced materials. For more details about the mechanics of glazing, read our blog about how double glazing works. Faulty parts: The parts of sash windows can become weak over time, leading to your sash windows not opening or closing properly and becoming stuck. Our windows come with durable fittings for slick opening and closing. 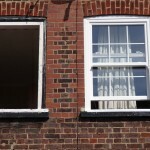 The condition of your window frames: Are your timber window frames rotting or warping? Due to its organic properties, wood can deteriorate over time when exposed to too much water or heat. All our sash windows come with a durable coating, so even if they are timber, they will be more resistant to weather damage. Windows with single panes: Many sash windows will come with single glazing, rather than more modern double or triple glazing. Double and triple glazed sash windows will offer far superior energy efficiency, so will reduce your energy bills and carbon footprint and leave your home warmer during chillier times! External noise: Do you live on a busy road and hear traffic noise? Double and triple glazed windows can offer excellent acoustic properties, leading to a more peaceful home. For a free no-obligation sire survey and quotation for vertical sliders, casement windows or timber windows in Motspur Park, call us now! For more information about any of our products or to seek advice from one of our glazing specialists, please call 0208 542 2233, email us at [email protected] or jot your details down on an online enquiry form and we will get back to you.